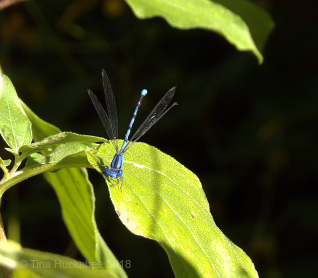 This entry was posted in Uncategorized, Wildlife Gardening in Ausin, Wildlife Habitat and tagged Blue Jay, Familiar Bluet by Tina. Bookmark the permalink. For flowers, true blue is actually the rarest of the ‘common’ colors. (Green, brown, black and gray are probably more rare.) Most blues are somewhat purplish. Yes, that is true! Some more purple than others. I am from the NE where winter is gloomy. I spent a winter in England and didn’t really think it was so bad, but now that I have lived in the Texas sunshine and blue skies, I can hardly survive one gloomy day. Haha–it just goes to show the power of a good dose of sunshine. It’s interesting that you didn’t miss clear skies and sunshine so much before you were in it year-round, though I’m not surprised. I’ve been putting together a post about a perfect day we had last week. I’m sure you also shared that day in your side of the state. We have a lot of perfect days this time of year! Lovely description! We just went through that crazy storm as well, being just north of San Antonio. But today you must be enjoying the blue sky again because there isn’t a cloud in the sky here! Yes–the sun reappeared about 2 hours ago and I just took a nice, long walk in its glory! It’s cold, but gorgeous! Tina the Blue Jay how nice it is to bathe. The family Bluet has a beautiful blue color. It is normal to remind you of a blue sky without clouds. When it rains, it’s always sadder because you do not feel like walking down the street getting wet, picking up the car and enduring the traffic jams. I stay at home reading. When the sun shines, although it is cold, it makes you want to walk through the countryside, go to the parks and observe the birds. I am glad that the storm has passed and the sun has risen again. Have a great week. Greetings from Margarita. Like you, I enjoy reading on cold and especially wet, days. You have a great week too, Margarita! People often look at me oddly when I say I moved here for the sunshine. If they don’t look at me oddly, I know they, too, have spent enough time farther North to understand. Haha–that’s funny! I loved visiting Oregon and somehow, don’t think I’d mind the dark and cold there, as it stays so green. But, I’d need a lamp…. Can you imagine what cold, gray, and rainy-damp does to those of us who have to have decent weather (or at least not damp or rainy) to be able to work! Nothing is bette than rain coming on the weekend — except, of course, that means I can’t get out with my camera, either. I’m with you on feeling “enough, already,” though. Part of the trouble this year has been that the fronts have followed one another so quickly that we’ve only had a day or two in between, rather than the three or four days that have been common in the past. There have been many other years like this — I’m just happier when they stay away! Yes, weather doesn’t always cooperate with jobs or hobbies! I have a new camera and haven’t been able to do much–everytime I have a spare moment, we’re in some sort of wet. It’s been a chilly fall and I don’t have any real complaints, just wish the sun would stay around for a day or two before the clouds roll back in. Really loved watching bluebirds in the States, miss them over here. They are so much fun–such personality and beauty. Another favorite of mine are the Carolina Wrens Oh, what the heck, I adore a bunch of different kinds of birds! Oops, I meant blue jays! That’s great because that’s how I read it! “Sapphire” is really the perfect word to describe the Texas sky. And I love blue jays so much – they are one of the very few birds that I feel comfortable identifying. 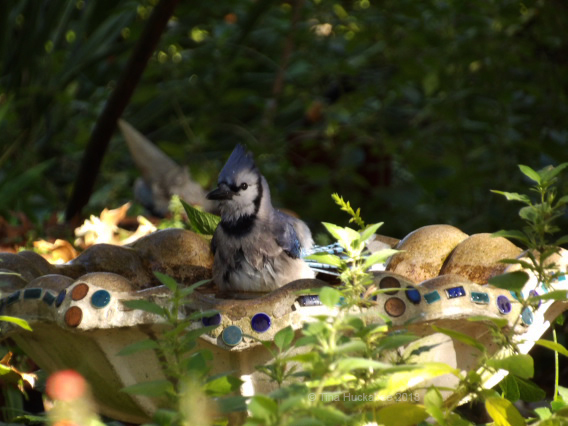 There’s no mistaking a blue jay! It’s certainly easy to spot blue jays, with their color and calls. It’s fun to learn about birds and here in Texas, we have a great variety and so many migratory birds, too. We recently went through two or three weeks of gray skies every day. The blue skies have returned for now, though. I do enjoy watching Bluejays, despite the racket they make. I’m sure you will have blue skies again before too long (isn’t there a song along those lines?). Yes, we’re back in the blue and there is a song about blue skies. Ella wrote it, but Willie did a great version of it. I’m with you, Tina. For as much as I love and appreciate rain, when the days drags on for weeks with only soggy, wet, leaden skies, even I long for that exhilarating shred of blue. Hope you get enough to recharge yourself before heading into the next stretch of gray. That’s the one good thing about Austin: one doesn’t have to wait long before the return of the sun!